I hope everyone enjoyed their weekend!! My kids started swimming lessons this week, so of course all I'm thinking about is HAIR HAIR and more HAIR!!! As a little girl, I did one swimming class session and quit, because no one wanted to fool with my thick hair. As I got older, I didn't want to swim, because I was afraid the chlorine would break my hair off. The good thing about my daughter is that she is natural and I am so blessed that I was able to learn about hair care, so hopefully we will be able to succeed with swimming. I am very pleased with my daughter's hair and I have to say the key to growing her hair is moisture! I can't repeat that enough. 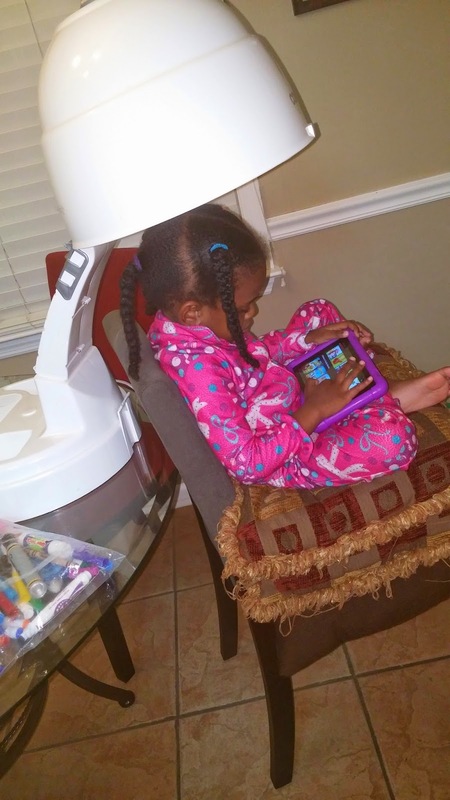 I know a lot of moms struggle to get their daughter's hair to grow or get it healthier, so I wanted to share my daughter's regimen that could possibly help you. The goal is to shampoo her hair once a week. I like to apply a dime size amount of Shea Moisture shampoo to her scalp and massage each section. Oh yeah, I like to section her hair into 4 braids. I do that so I can make sure that each section is cleaned and tangled free. Now it's time to use a good creamy rinse out conditioner. I like to use Herbal Essence Hello Hydration, Castor oil, and Aubrey Organics Honey Suckle Rose. I actually mix it up and apply to each section. I like to use my fingers to detangle her hair. This is very important and shouldn't be something you skip. I will focus on the section and gently pull apart any tangled strand that I feel. The conditioner gives it a good slip where detangling the hair is a breeze. If you're having a hard time finger detangling, simply add more conditioner. After I detangle a section, I twist the hair and start on the next section. Once you have completed each section, you can go ahead and rinse each section. Now the hair is ready to be moisturized with a creamy leave in conditioner. There are a variety of great leave in conditioners you can use, but I like to use the Generic brand Paul Mitchell the conditioner that you can purchase at Sally's. The hair is still in 4 sections and I like to apply the leave in along with castor oil. I unravel the twist and apply to each section one at a time. Once I apply the conditioner and oil, I'm still using my fingers and making sure the conditioner is getting applied from root to tip. I focus on the ends because that's the oldest part of the hair. Once I finish, I braid or band her hair. During the week, I keep her hair in 4 braids or use the banding method. I love when she wears 2 puffs, but I keep that for the weekend or special occasions. Most of the time, her hair is banded. 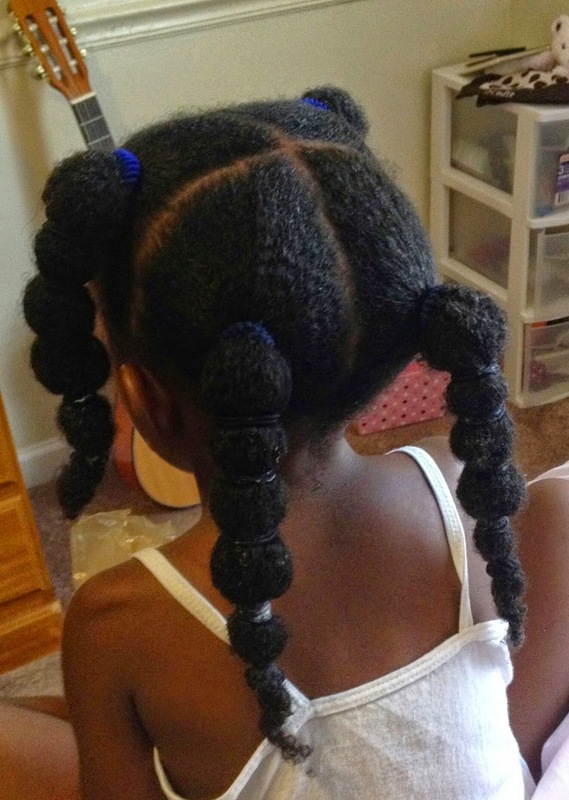 I also love to use this product called Curls ( you can find at Target) for her edges. Great product and so much better than gel!!! Before we go to swimming lessons, I like to saturate each section with conditioner. I braid each section and put each braid in a ball. Hair is freshly washed and banded. Hair is freshly washed and braided up.